Ford Trademarks Corsair Name, Hinting At Future Car? 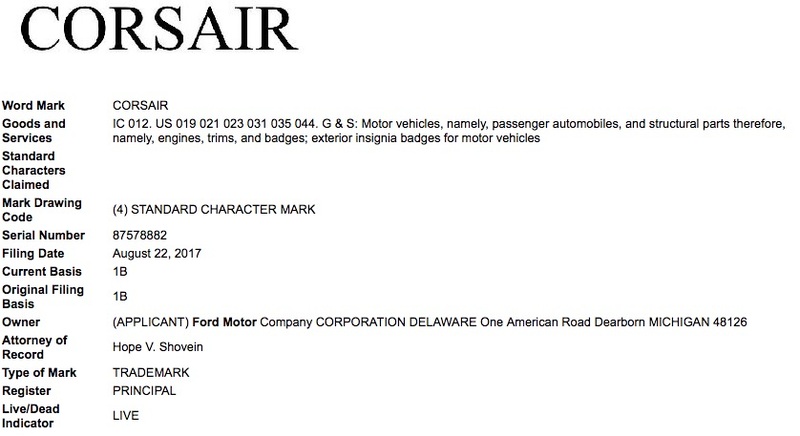 Ford Motor Company has filed an application to register Corsair as a trademark with the United States Patent and Trademark Office (USPTO), Ford Authority has discovered. Filed on August 22nd, 2017, the application is assigned serial number 87578882 and specifies that the mark will be used in conjunction with “Motor vehicles, namely, passenger automobiles, and structural parts therefore, namely, engines, trims, and badges; exterior insignia badges for motor vehicles”. The Corsair name was used on two different kinds of vehicles throughout Ford Motor Company’s history. The first instance was a vehicle produced by Ford of Britain between 1963 and 1970, and between 1989 and 1992 for an unrelated sedan and hatchback based on the Nissan Pintara sold by Ford Australia. What plans Ford has for the Corsair name is currently anyone’s guess. We will keep our ears to the ground on this one, so be sure to following Ford Corsair news and other Ford news right here at Ford Authority. Ford’s Edsel division used Corsair as a model name in ’58 and ’59. you forgot that edsel used the corsair name on their higher priced car line from the 1958 and 59 cars. shame on you forgetting a great car designer and henry fords only son.